It's a dreary Halloween eve in L.A. A little rainy and cloudy here today. Found a nice video treat: Gladys Knight singing From This Moment. I think at a wedding. It's originally done by Shania Twain. Love both versions. Happy Friday. Happy Halloween if that's your thing. Enjoy this moment... and make a memory tonight! It's that time of year again... National Novel Writing Month. Each November, thousands of would-be novelists try their hands at completing a 50,000 word draft of a novel in 30 days. The website provides plenty of supportive tips and resources for working toward the goal. Another site, Paperback Writer, offers tips for succeeding at NaNoWriMo. The idea is geared toward quantity -- that is, pushing those who sit with the idea of writing to do so. The quality comes later, as the first draft turns into a revised second and third draft. For NaNoWriMo, 50,000 words is a good beginning (about 175 pages). Most fiction manuscripts aim for minimally 65-70,000 thousand words. If you're up to the challenge, give it a try. 50,000 words over 30 days comes to about 1,600 words daily... or about 6 pages daily. And with the economy the way it is lately, and many of us saving money by staying IN, might as well stay IN with the notepad and/or keyboard for the month of November and create something that could pay off in the long run. Toni Morrison reads from her new novel, A Mercy, on NPR this week. TV Guide Canada celebrates the best-written in daytime television, Young and the Restless. Guide To Literary Agents blog answers all the questions you have about getting your novel represented by an agent. The Spendid Table shares the best in food, food writing and recipes, and succulent dining at home. Finally, in case you didn't know it... Toni Morrison graces the cover of the latest Poets & Writers. Been a YouTube addict this afternoon going down soap opera memory lane. 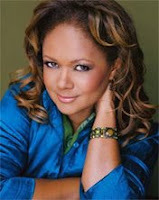 One of my ALL TIME favorite storylines on Young and The Restless was when Olivia, played by the fabulous Tonya Lee Williams, found out her husband, Nathan, had been having an affair with Keesha, who happened to be HIV-positive. Such a well-written and well-acted storyline by all involved. And it showed how good Y&R was with its realistic black characters... especially with the following clips featuring Olivia and her sister Drucilla processing about "what a dog" Nathan is. What made the storyline work was the classic Y&R formula... slow build up to the scenes you see here. Olivia was an ambitious doctor, who worked a lot of hours. Nathan felt neglected, didn't like that Olivia wasn't home all the time and that she'd hired someone to look after their son. Soon, Nathan met Keesha out in Genoa City (I believe on a case he was working on, Nathan was a private investigator), and their affair started. Keesha found out she was HIV-positive from a previous lover... and all hell broke loose. Nathan HAD to tell his wife about the affair and the exposure to HIV. It took a good year for this storyline to play out. And this was long before HIV and the black community made headlines. Olivia and Dru talk about Nathan. Part 1. Olivia and Nathan Part 2... and Part 3. We recently finished a MAJOR construction project at my day job, so I've developed a thing or two for contractors, construction workers, and people who make something from nothing. I mean... they made the new place fabulous. So when I heard about this novel, Confessions of a Contractor, I knew I had to pick up a copy. The novel is by Richard Murphy, and is a humorous and detailed story of a contractor in the middle of a steamy love triangle with two wealthy clients whose houses the contractor is working on. The competitors in this love triangle are two ex-best friends. Sounds fun and like a good read to escape from the day-to-day build up of stress and money woes. Quite timely and tech savvy for the late 2000s. STD notification by anonymous online e-card. Story on MSNBC.com. The service is available in many major U.S. cities, via inSpot. A group of students and I were talking about the ease of online relationships for the kids of the late 80s and early 90s. Maybe this service can make it just as easy to take care of their sexual health. Imagine opening up your email and discovering you've got mail... and more. I guess better to learn this way, than never to learn until it's too late. The good one... an interview with Annie Proulx in the L.A. Times. Proulx is the author of the short story which is the basis of the film Brokeback Mountain. Very good interview, with some surprising insights into life in Wyoming and life as a writer. 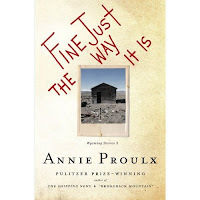 I've written about Proulx and her writing on this blog before. The bad surprise... I went to my neighborhood park to run this afternoon. Lots of cars, red t-shirts, and people gathered. I figured it was one of the weekly festivals or yard sales they hold. It was a Yes for Prop 8 rally. For those of you not from California, Prop 8 is seeking to write in the state constitution the definition of marriage. It seeks to take the right of marriage away from gay and lesbian couples who would like to get married. A YES vote would define marriage as between one man and one woman, and write it into the state constitution. A NO vote would not write a definition of marriage into the state constitution, meaning that people could marry the one person they want if they choose to marry. I was surprised that 1) my town park gave a permit for a group to host a Yes on 8 event, and 2) that this event was clearly targeting the Asian Pacific Islander community as the group of choice to deliver the discriminatory message, based on who was present and the languages and symbols on t-shirts and signs. For the record, I am voting NO on Prop 8 in California. I believe that anyone who chooses to marry another person should have the right to do so. Taking away rights, and writing such measures in the state constitution, isn't fair. But back to Annie Proulx... here's a list of her books available on Amazon. Definitely some work not to be missed. So I just found out that my friend Liza Palmer's first novel, Conversations with the Fat Girl, has been optioned by HBO for a series. That's great news. I'm happy for her. It's such a great book and voice, and I can totally see it as a series. Liza and I started out around the same time with our publishing journey. I've written about her books, Conversations and Seeing Me Naked on the blog before. In these tough economic and political times, we're all looking for good escapist options to get our minds off of things. Miriam Goderich, of the Dystel & Goderich literary agency, shares her desire to be swept away by a good new book across her desk. One option to escape... travel. Our friend Tayari Jones is heading to Ghana in early November for International African Writers' Day. Finally, you and your literary agent are trying to get a better deal for your book. The Book Deal blog offers these options. Have a great one... create a memory today! 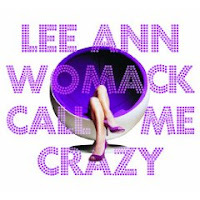 Call Me Crazy is the newest release from Lee Ann Womack, who is one of my favorite country singers. It comes out on Tuesday and has already gotten "Album of the Year" type reviews already. I love country music, if you didn't know already, for a number of reasons. Mainly the lyrics. And Lee Ann Womack tells some stories, that are quite relatable in the lyrics of her songs. Anyway, hope it's a great weekend for you. Make some memories... and call me crazy! When I was in grad school from 95 to 97, I got caught up in Days of our Lives. One of my cohorts in my program got me hooked on the tail end of Marlena's possession. Then I fell for the Sami/Austin/Carrie triangle. Finally I got hooked on the story of all stories... Marlena/John Black/Kristen triangle, which eventually brought us Kristen (and the actress Eileen Davidson) having identical quadruplet siblings (Susan, Sister Mary Moira, and the brother whose name I don't remembeer) all appearing on screen. Those stories all had one person in common. Days' head writer at the time, James E. Reilly. Reilly died over the weekend. Daytime Confidential has a really great remembrance of Reilly's stories he brought to Days. One of the things he was credited with was Days' rise in ratings in the 1990s from #7 to #2 for many years. Often his stories were panned by critics, but LOVED by fans. I know that those of us in book writing profession are often deluged with debates and discussions on the popularity/quality continuum. But this isn't about debates or popularity or quality. I know I enjoyed Days for the two years I was in grad school. Often, I look back on those days... and Days with a lot of fondness. Before Barack Obama and Hillary Clinton made history in 2008, there was Shirley Chisholm, who started construction on their road in 1972. 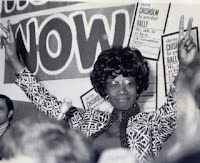 An advocate for the poor, communities of color, women, working people, and young people, Chisholm became the first black woman elected to U.S. Congress, and later, the first black and woman to run a serious campaign for the U.S. President in 1972. In fact, she is considered the only woman to date (until Hillary in 2008) to have even been a contender. I have seen this documentary, Chisholm '72: Unbought & Unbossed, many times. I always learn something new. Fascinating film. Fascinating woman. If you get a chance to see it, you should. Check out another official website for the film, Chisholm 72. In 1972, Shirley Chisholm ran for the Democratic presidential nomination. Though many said it was more symbolic, she (and history) assessed it to be groundbreaking, serious, and a way to pave the road for women, people of color, and the poor to run for president. In fact, she racked up enough delagates along the primary race to play a major role in the Democratic platform and ticket in 1972. In her book, The Good Fight, she wrote, "I ran for the presidency, despite the hopeless odds, to demonstrate the sheer will and refusal to accept the status quo. The next time a woman runs, or a black, a Jew, or anyone from a group that the country says is 'not ready' to elect to its highest offices, I believe that he or she will be taken seriously from the start." Now, some 36 years later, we're seeing the road she paved has made it possible for people like Barack, Hillary, and even Carol and Al and Jesse to run serious campaigns. Based on what I saw in the documentary, Chisholm was a fierce, strong woman, who was not afraid to speak her mind, rattle the powers that be, and always had intelligent and assertive statements to make. She was definitely unbossed and unbought. Definetely a role model and someone to add to your "to know about" list. And definitely another reason you should vote for CHANGE in just a few short weeks. I've always loved Diahann Carroll. Though she had a career long before I loved divas, my first real exposure to her was as Dominique Devereaux on Dynasty. 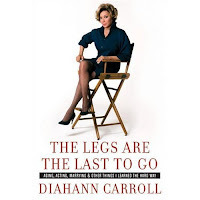 Now, Diahann has a new memoir that recently came out-- The Legs Are The Last To Go: Aging, Acting, Marrying, and Other Things I Learned The Hard Way. When I was a kid, I read her autobiography Diahann! and I remember really admiring her work and life. I'm sure Legs Are Last will be a good read as well. Diahann Carroll talks about her life and new book in this NPR interview with Michele Norris. Dominique and Alexis... the slap heard around the world. OMG... thank God I'm nowhere near retiring. I just took a look at my 401K account with my day job. Not cute. This economy thing is no joke. Grateful I have a day job... and have that long-term nest egg building. Still, when you look at the numbers. Ouch. It's scary. You checked your numbers lately? Or are you a little afraid to do it? From Octavia E. Butler's Parable of the Talents, a novel I have yet to read, but is in my collection. I think it's a great quote and quite timely. What do you think? "Choose your leaders with wisdom and forethought. To be led by a tyrant is to sell yourself and those you love into slavery." Rainy Saturday night in L.A., and I'm staying in for the night. It's a little weird to not be doing something outside the house, but it gives me a chance to catch up on the blog thing. And no... I haven't been dumped, like the cover picture suggests. You gotta be picked up to be dumped :-) I just love that cover. Looking for a literary agent? Here are some questions you can/should ask potential agents? A lot of agents talk about the author platform. What is it? And how can you build yours? You're a writer, but the words just aren't coming... Buzz, Balls, and Hype on When The Well Runs Dry. Can book sales weather the bad economy? Tess Gerritsen share her perspective. Hope your Saturday/Sunday in or out are fabulous! This weekend at the West Hollywood Book Fair I had the opportunity to sit in on a reading for the anthology, Love, West Hollywood: Reflections of Los Angeles. It was a great reading, featuring some of the contributors who shared stories on the "glory days" of West Hollywood, challenging domestic partnership recognition at local hospitals that serve LGBT communities, and growing up the child of a black celebrity in Hollywood. 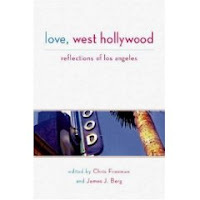 Of course there are many other subjects and topics covered in these reflections of life in West Hollywood and life in surrounding communities. And it reflects the ethnic, social, gender, and class issues that are very much a part of life in SoCali. The anthology editors, Chris Freeman and James Berg, brought together a diverse group of writers for the anthology. If you have a friend in your town who is a native of L.A., this could be a very nice holiday gift for them. And even if you live in the area, Love, West Hollywood can be a nice addition to your book collection.